Want less stress at work? Want less absenteeism? Then make cleanliness a priority if you want a healthier business overall. Have you ever visited an office that hadn’t emptied its garbage cans in a long time? Or one whose carpets were full of mud, crumbs and stains? What was the impression you got? Running a business can be stressful, but doing simple things like committing to keeping a clean office can really help employees (and the overall business) perform better in the long run. If your office is dusty and dirty, with mold, mildew and allergens filling the air people breathe, you’re going to have more absences than the competition due to sickness. If you’ve noticed your employees cough a lot, their eyes water, and/or they’re always sneezing, it may be time to have the place properly cleaned. Besides cutting down on absences from work due to sickness, productivity goes up when people have a clean environment to work in. Messes can become distractions at work– the fewer of them, the better. Customers judge a place based on its appearance. You can literally lose customers (and thus lose money) because they see your place as dirty… and they don’t want to spend time in your unhealthy environment. This is especially true with eating establishments. As you know, first impressions matter a lot. Therefore, for good morale and positive feedback, a clean workspace is key. When’s the last time the windows were washed? Do the plants ever get dusted? Does the flooring look like it desperately needs a waxing? People feel better in clean places, so you should make sure yours is clean. 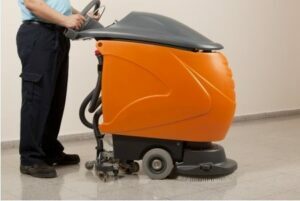 5 Star Janitorial is in the business of cleaning businesses so they can be healthy, successful businesses. Serving Ontario, CA, 5 Star Janitorial provides commercial janitorial cleaning services, and can clean your office, storefront, restaurant, bar or other workspace well. Call 909-233-5135 for more information today.